This Game Day Caesar Salad Bar with Homemade Dressing–with Blue Diamond Almonds–is a healthy way to serve your party guests! 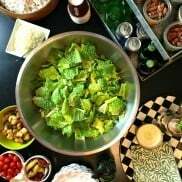 There are a zillion recipe twists on the Caesar salad, and most recently for a Game Day Party, I set out ingredients for a Caesar Salad Bar, and let our guests build their own salad. 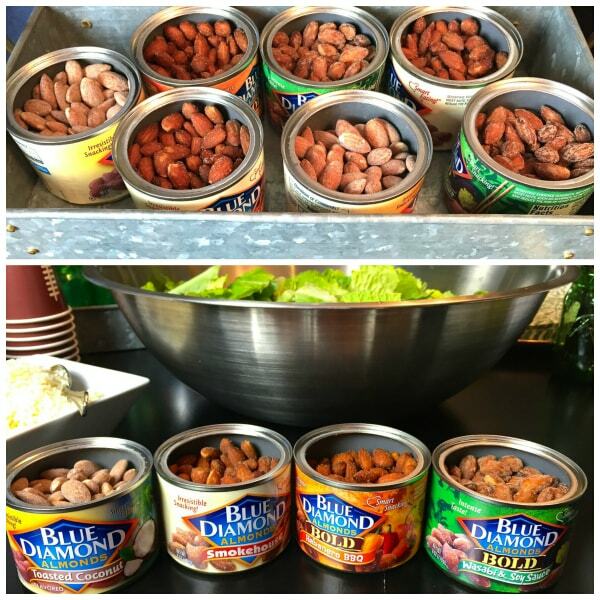 For Game Changing Snacks, the special toppings of Blue Diamond Almonds were used as salad enhancers, plus fun-flavored party snacks! I like to change up a Game Day Party with something new. In the past we’ve served chili, sliders, everyone brings a potluck dish—there’s no right or wrong way for Game Day. The bottom line is, it’s all about the game–and the food! Game Day Caesar Salad Bar. 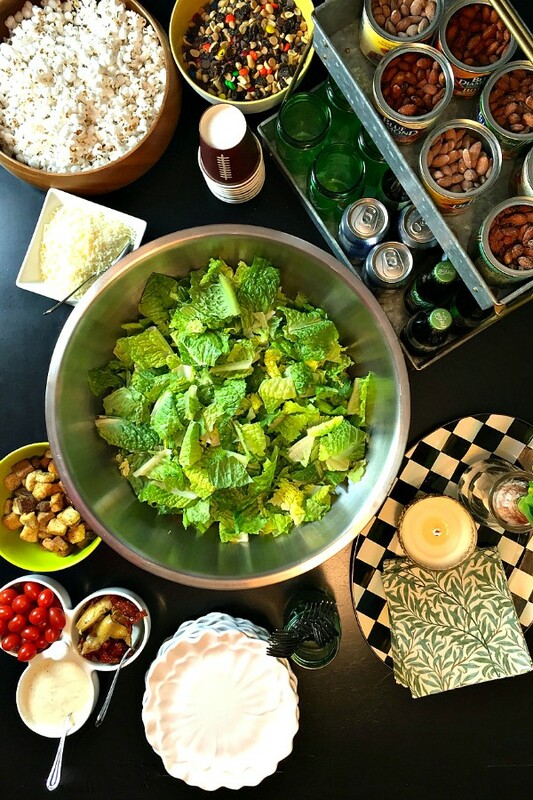 Deciding to keep a healthier party, I set our table with all the ingredients for guests to make their own Caesar salad. We had other veggies and dips, of course, but the “talk of the party” were the Blue Diamond Almond’s new flavors: Smokehouse, Wasabi & Soy Sauce, Toasted Coconut and Habanero BBQ. 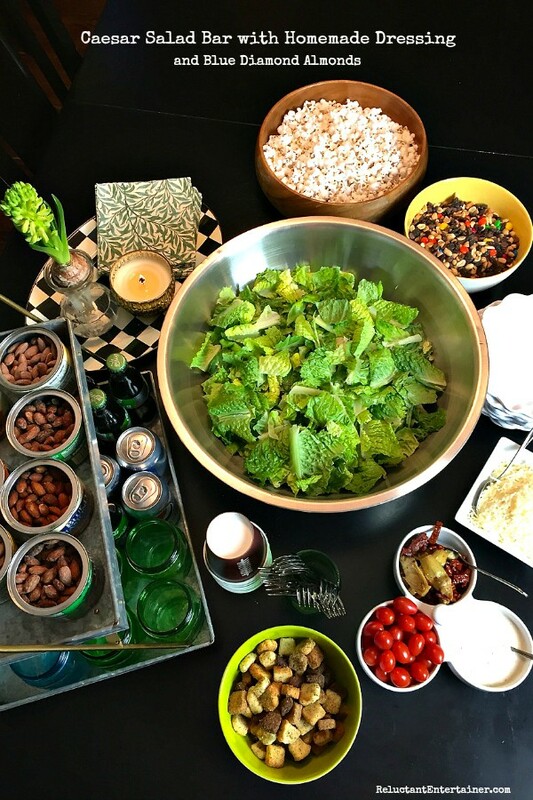 All lined up and ready for snacking, our guests made their salads with the ingredients that they liked, and then added their favorite flavor for the topping. 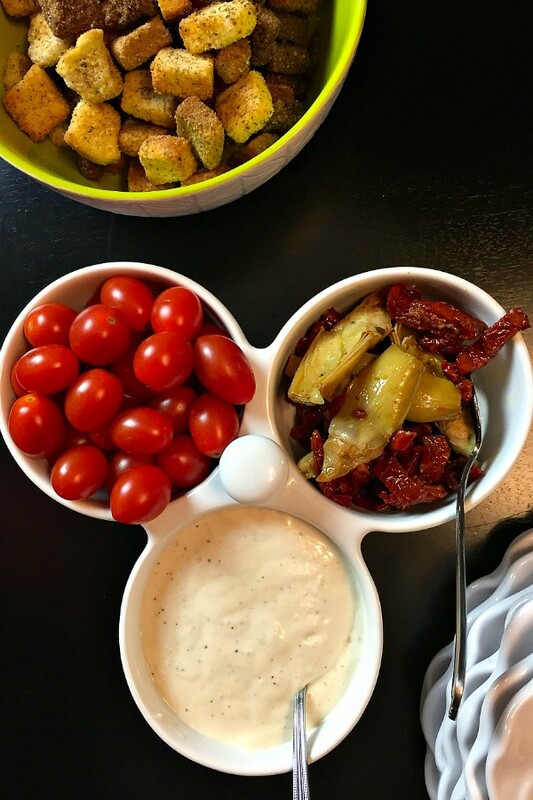 I loved this idea, because it was not only a bit healthier than a normal Game Day party, but people could come and graze at the table and try the different flavors. Of course we had other healthy snacks. Drinks and popcorn, a couple other main dishes, and a few desserts. But the Caesar Salad Bar was what everyone really enjoyed! 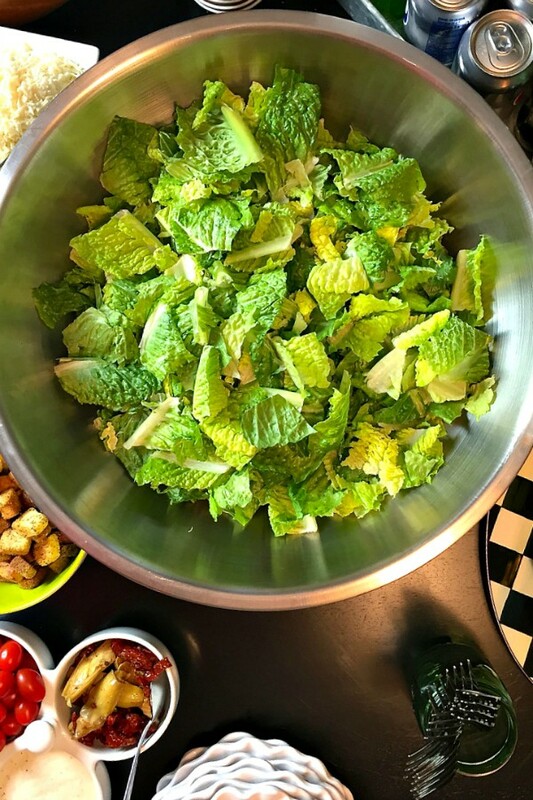 To make it easy for your next party, I’m including the recipe below (with a healthy Caesar salad dressing made with Greek yogurt), but also tips to help YOU create your own salad bar. -Giant stainless steel bowl. I purchased this bowl at our local Cash n’ Carry (a restaurant warehouse business). -Romaine lettuce. 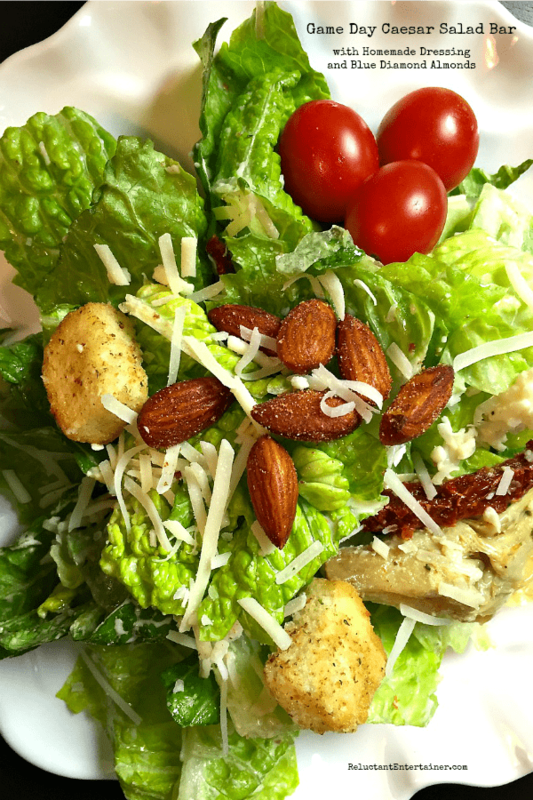 A good Caesar is all about fresh, clean, dry, crisp leaves for this salad. You can buy the lettuce bagged, or fresh (tear the lettuce into bite-sized pieces and put them in a bowl). 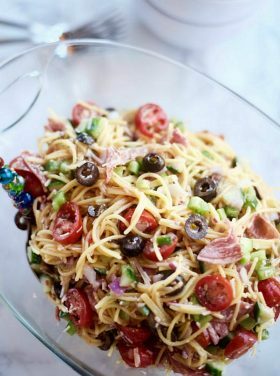 -Make sure you have toppings such as sun dried tomatoes, regular tomatoes, artichoke hearts, and Parmesan cheese (freshly grated is always best). -Croutons. You can use store-bought croutons, but you can also make your own by taking a baguette and cutting it into 1-inch slices, about 3 cups’ worth. Slice the bread into cubes and put them in a bowl. Toss in 3 tbsp. of olive oil and 1 tbsp. of garlic powder. Mix together to coat the bread, and lay the pieces on a cookie sheet. Toast in the oven for about 10 minutes, or until the bread is nice and brown. -Set out different flavors of Blue Diamond Almonds. 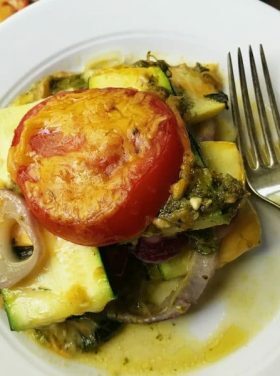 -Make your own dressing (recipe below), because it always tastes best homemade! Your Caesar Salad Bar is complete. 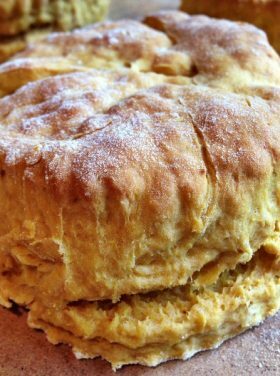 Enjoy the recipe below, and with Game Day ahead … we hope your favorite team WINS! What’s your favorite Game Day salad to make for a large crowd? Dressing makes 1 1/2 cups. 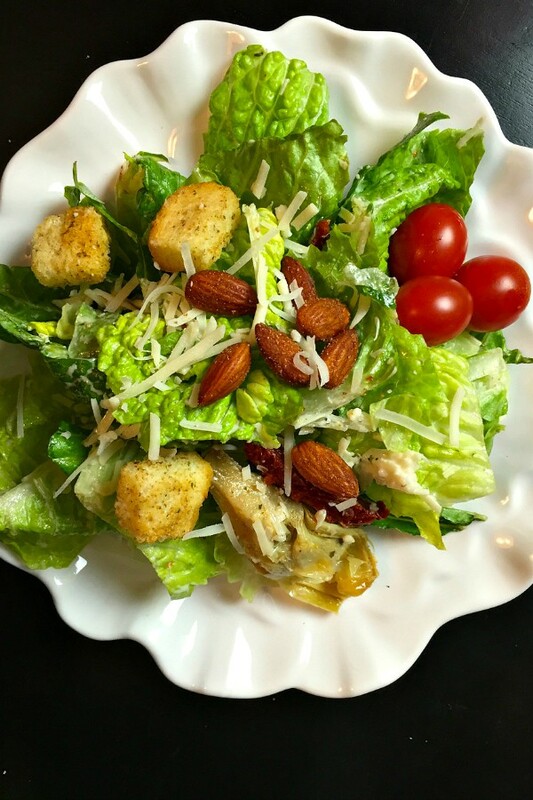 Combine the lettuce, sun dried tomatoes (and/or regular tomatoes), artichoke hearts, croutons, and Parmesan cheese in a large bowl. In a small bowl make the dressing by combing the Greek yogurt, olive oil, lemon juice, garlic, salt, pepper and 1/2 cup Parmesan cheese. Mix together well. Right before serving, toss the salad with dressing (don’t over dress the salad); serve! 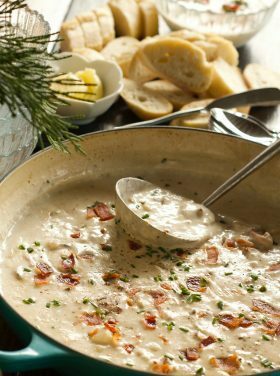 Looking for a full game day menu? This post is sponsored by Blue Diamond Almonds, for their “Game Changing Snacks” campaign, but as always, all opinions are my own. 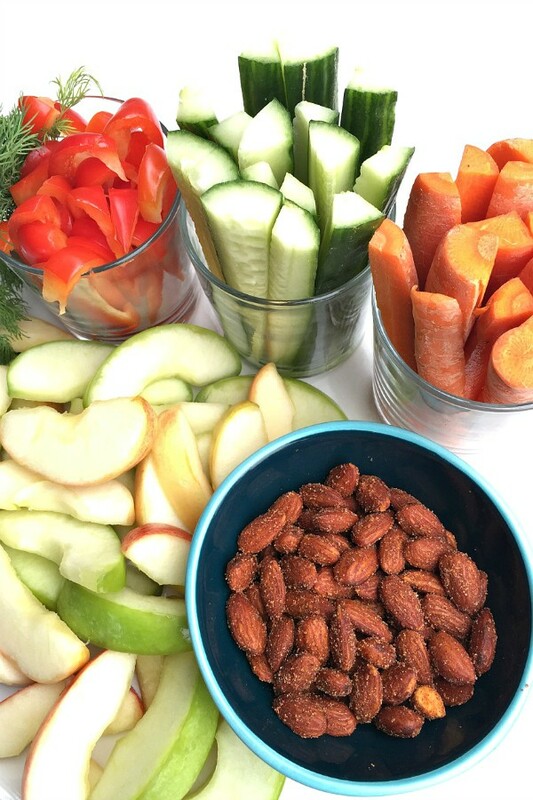 Looking for more game changing snack ideas? Visit Blue Diamond Almonds on Facebook, Instagram, and Twitter. 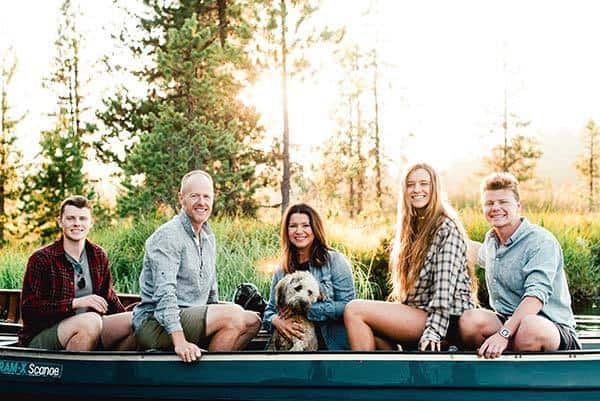 Are you following me on Instagram, Twitter, Facebook and Pinterest? Thanks being here today, and if you’d like to subscribe to Reluctant Entertainer, to have each post delivered straight to your e-mail box, then please add your email, here. It’s really easy! 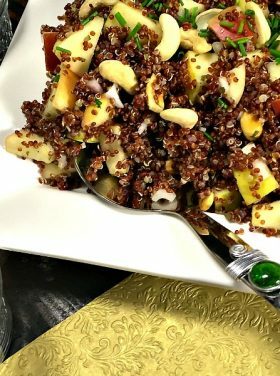 Quinoa Apple Cashew Salad and What is Happiness? Blue Diamond Almonds – I could eat my weight in those. YUM! Let’s face it….. 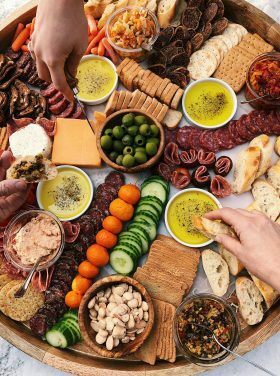 I would love this…..but it would be the last thing I would ever do because my guys would kill me if this was our Super Bowl food. It is just life in a house full of testosterone. Off to the side you can have a pot of chili and sliders, etc. for the hungry men! This is the “healthier” table. LOL! 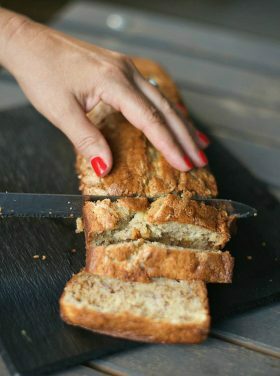 What a great idea its always helpful to get ideas for healthier options when hosting a casual meal. 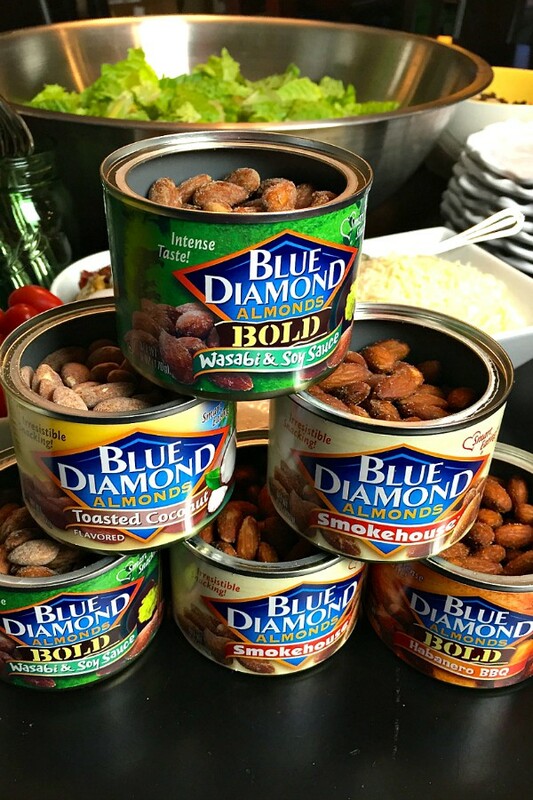 I love Blue Diamond Almonds – especially the smokehouse flavor. I found a random container of these in my pantry ( no clue where they came from! ), but now I can’t stay out of them! The toasted almond looks really yummy too. I love EVERYTHING about this!! Such a great idea Sandy, and a great presentation. Fun way to serve a salad at a party! And YAY for healthy game day food!